We grow great Hardneck Garlic here at Froggy Meadow Farm. Music garlic has 5-8 cloves in its' large bulbs. It has a wonderful rich pungent flavor. Stored properly, it will keep for 6-10 months. Garlic is harvested in July and cured for 4-6 weeks. We begin taking orders in Mid-July and ship in September. Our garlic sells out quickly every year. Garlic is available for Pre-order now with shipping in September. Order at our online store at localharvest.org. or email us directly to place an order. Also available locally in June, we have fresh garlic scapes. 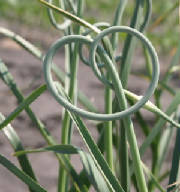 Scapes are a long curling section of the plant stem which has a flavor like a garlicky green onion. They can be used in salads, soups, or anywhere you would use a scallion or green onion.